Okay, you’ve got some sheet music to play and you’re ready to bring your A game, so now what? Well, you need a good place to put that sheet music so that you can easily read it, and move through the pages, while you sing, play your violin or other instrument. Now, you could cobble something together with random stuff you have around your house, like my friend Brad does. But if using random household objects doesn’t appeal to you, there is a better option – a sheet music stand. 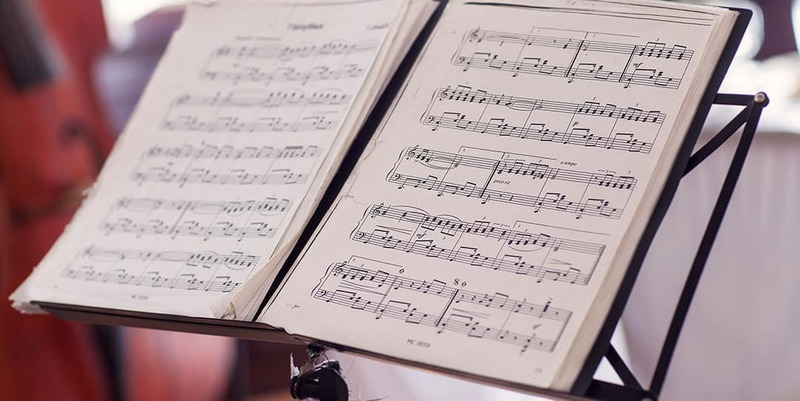 Sure, you may have landed here knowing that a good sheet music stand is exactly what you’re after, but you might not know what to look for when shopping for one. Lucky for you, we can help you out. And while we currently only have experience using one of these with a guitar and keyboard, the truth is that you can use one of these with any instrument that you play….yes, even the drums, but we’re sure you already knew that! Below we’ll give you a list of some of our favorites, along with some tips on what to look for if you want to do the shopping on your own instead of using our recommendations. While you may think that along as it holds your sheet music, then you’re cool with whatever, we beg you to reconsider that line of thinking. There are some standard features that you may want to consider looking for when evaluating the different models of stands that are available for you to purchase. Below we’ll go through those features that we think are worth your consideration. How Stable Is It? The last thing that you want to deal with is a stand that wobbles as you flip the pages. We find that the most stable options have solid backs instead of wire-frame models. If you’re shopping in a local store, then you can test for wobble. But if you’re shopping online, then check out reviews to confirm stability before buying. How High Is It? Consider how you’ll be using the music stand – will you be sitting or standing at a microphone? For standing use, you’ll need something with a good height range on it. And if you’re abnormally tall or short, then keep that in mind when checking out the height of any stands you’re considering getting. How Deep Is It? Want to be able to store a couple of songbooks on the stand? If so, you’ll need one with enough depth to accommodate more than a few sheets. Keep in mind that if you’re a beginner, then this probably isn’t really a big deal for you. Does Color Matter? Depending on how you intend to use it, the color may be an important feature to consider. For instance, if you will be performing in public, then you need a solid color like black. And if you’re performing as part of a group, there may even be a requirement for the color. How Portable Is It? If you need to take the stand from your home to your practice location or performance location, then you need something that offers good portability. 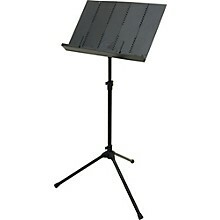 This is often when a folding sheet music stand is preferred because it is easier to transport. How Wide Is It? While room enough for two pages is all most people need as beginner’s, as your skill level increases you’ll want a wider space for more sheets. So, you may want to plan ahead and get a wider one now. Or, maybe you’re already past the beginner level and need that extra width. Does It Tilt? For some musicians and singers, tilt ability is a must-have features. This lets you easily view the music at any angle. We find this to be important if you travel with the stand because you never know what your performance space will be like and you may be cramped to the point of needing that tilt. Do You Need Shelves? Some stands come with built-in shelves for those of us who need room for extra accessories and songbooks. So, if this describes you, keep your eyes out for a model with some extra storage space. Now that you know everything to consider before buying, you may have some up with a few new questions as you start your shopping. Below we’ll cover some of the more common questions that we encounter about music stands. And if you have a question that isn’t answered here, then leave a comment below and we’ll try to answer it for you. Why Do Music Stands Have Holes? Called “vent holes,” the holes that you see in music stands are not just a cool design. They actually have a very specific purpose. In fact, they lower the overall weight of the stand and make it less top heavy. The benefit of this is more stability when tilting it or when you have it extended at a high height. Folding Music Stands vs Standard Static Music Stands – What’s The Difference? The real benefit of folding music stands is that they offer more portability since they are more lightweight and breakdown into a more easily transportable size. However, that portability comes at a cost – folding stands are not as stable and durable as the standard options. Plus, the width on folding stands is much smaller than standard, which means you won’t be able to keep a couple of books on it. If you don’t need to travel with your stand, then we definitely suggest going with a standard model because they are more durable, have a better height range, and can hold more songbooks. Just keep in mind that they are heavier, as a result of stronger and more reliable components. What Accessories Can I Add To The Stand? Music stand lights – these are great for when you’re in a dark room or if you’re performing somewhere dark, like an orchestra performance. They just clip on to your stand. Headphone hangers – if you wear headphone when you’re practicing or recording, then this little device is perfect for you. It screws on and you can place your headphones on it when they’re not in use. Cup holders – If you play something like the tin whistle or flute, then you’ll want one of these as a great place to stash your brash or woodwind when you’re not playing it. Double shelves – If you need a little extra storage space on your stand, then you can add some levels to it with some nice double shelves. To help make your decision a bit easier, let us share our thoughts on a few of our favorites sheet music stands on the market. Below you’ll find reviews on a few of the models that you see listed up above. If you want a sturdy music stand that is portable, then a collapsible model is a better choice than a folding model. The difference between a collapsible and folding music stand is that the collapsible model has tripod feet the collapse together and the top tray portion slides or collapses downward. 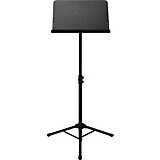 Our favorite one of these is the Gearlux Collapsible Orchestra Music Stand. It is lightweight enough for travel but sturdy enough to be a quality choice. It’s height range goes from 28 to 48 inches, and tray tilts back 180 degrees for optimal viewing in any situation. The depth is enough to accommodate a three-ring binder. And it is magnetic, if you work with loose sheet music. 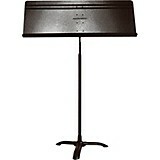 Plus, it has a great price if you’re looking for a cheap sheet music stand that is easy to transport and durable. One of our very favorite options right now, the Peak Music Stands Portable Music Stand gets our #1 pick for the best folding stand. It is very lightweight, which makes is perfect for transporting it everywhere you need to go. Despite being so lightweight, it is sturdy because it is made of durable plastic and piano hinges, and the tripod of high grade tubular steel. The height range for this one is 21″ – 48″. And it folds up into an ultra compact size to make travel a breeze. On top of all that, it has a great low price under $40 at Guitar Center! So, if ultra portability is what’s important to you, then we think you can’t go wrong this with model. Though they are less sturdy, some people just prefer to use a wire stand since they are super lightweight. 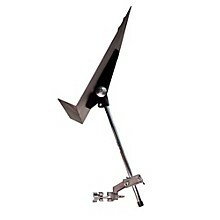 If you’re one of those people, then we suggest checking out the Musician’s Gear Folding Music Stand model. It has an incredibly low price. In fact, it is the cheapest music stand that we recommend at this time with a price under $10 at Guitar Center. Sometimes you can even get it for close to $5 when they are running sale! There is really nothing special about this model. It folds up for easy transport and storage and it works well for those who prefer a wire model. And it has page holders to keep your music book open to your preferred page. 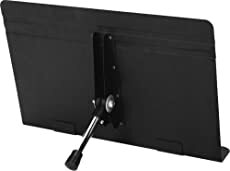 So, if a cool wire music stand is what you need, then we suggest checking out this cheap, but quality, option for your needs. 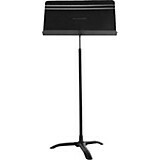 If you’re a drummer looking for a versatile music stand designed for musicians just like you, then check out the Manhasset 53D Drummers Music Stand. 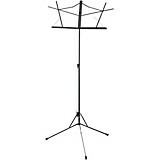 Out of the all options currently available to you, we feel that the Manhasset 53D Drummers Music Stand is truly the best music stand for drummers. It’s versatility is what makes us love it so much. Plus, it is very durable and overall a quality piece of gear. This stand has a dual clamp/dual swivel mounting system and a 16″ shaft that enable the device to be connected to all varieties of drumset tom mount hardware, hi-hat/cymbal stands and percussion equipment racks. We give this drummer’s music stand (5 / 5) for being the best on the market. Though not a lot of people end up needing a desktop option, I do know a few guitarists who prefer it. So, if you count yourself as one of those people, then we highly recommend the Proline PL53 Tabletop Sheet Music Stand model. It’s got rubber pads attached under the shelf, as well as on the bottom of the back leg, to give you stability. So, you don’t have to worry about it falling or moving when you flip a page or move a sheet of music. The shelf is relatively deep at 2-1/4″ and can hold a decent amount of music. It is also sturdy enough to support the weight of a full songbook. 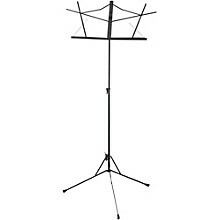 And based on it’s size, we think that it is a good music stand for a home recording studio, especially one where you don’t have a lot of space for a regular stand-up model. When not in use, it folds down flat for easy storage. Overall, this thing has a great low price and works well for a desktop option. Overall, these are the music stands that we feel are the best options on the market right now, but there are still plenty of other models out there for you to choose from if you don’t like any of the ones we’ve shared here. Fortunately, this is a very affordable piece of equipment and as long as you choose a sturdy model, you should be happy with whatever model you end up with at home. How Hard Is It to Learn Guitar by Yourself At Home?